The oxygen produced by cyanobacteria or ’blue-green algae’ is accumulating into the atmosphere and causes the mass extinction of anaerobic microbes. Oxygen breathing bacteria live symbiotically inside eukaryotic cells. These evolve later to become mitochondria. Cyanobacteria form the stromatolites of Tervola’s Peuranpalo in Peräpohja. The great oxygenation event was one of the bigest disasters in the history of Earths biosphere. Oxygen is a dangerous compound that poisoned the oceans and atmosphere. Also, due to the oxidation of atmospheric methane, Earth was frozen to an iceplanet that did offer only few niches for life. Simultaneously also availability of many nutrients changed. For example earlier two valued iron had been readily available, but had now oxidized to the insoluble rust in the process that generates very toxic oxygen radicals. The huge number of microbes disappeared. Many retreated to the safe anaerobic conditions, but in some species complex protective mechanisms evolved and they learned to tolerate oxygen. Some of these species even learned to utilize this reactive poison as a superior energy source. These aerobic organisms were able to diversify after the ice retreated. One of these oxygen utilizing species was an early Eukaryote, from which all complex multicellular life originates. 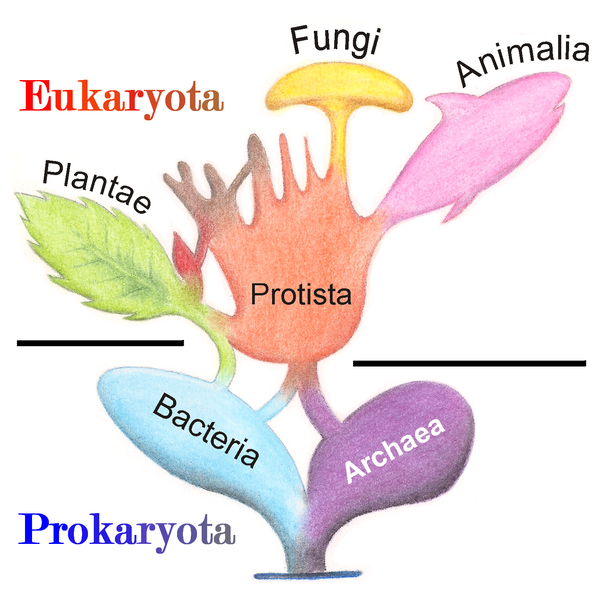 All plants, animals, fungi and various protist groups are eukaryotes. Eukaryotes are much more complex and larger than prokaryotic Bacteria and Archea. 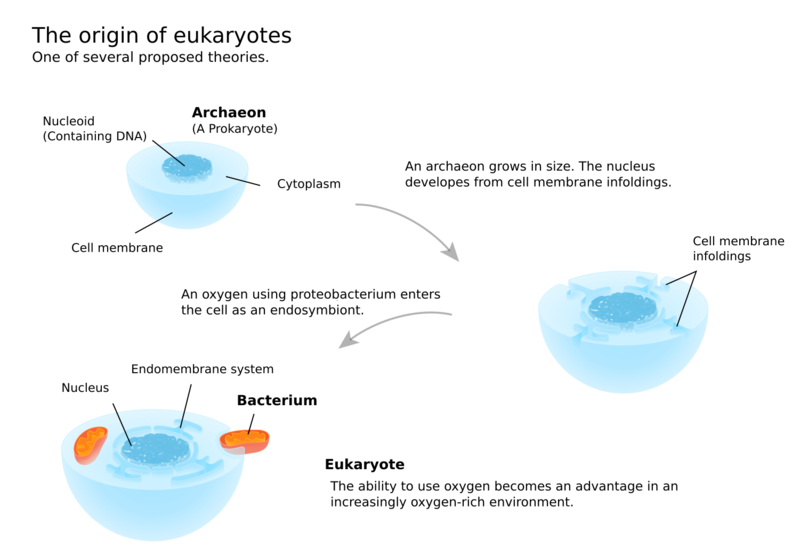 Eukaryotes have, for example, nucleus and other cell organelles. Without Eukaryotes there would be no complex multicellular life. There exists different views about the origin of Eukaryotes. The first fossiles are about 1.8 billion years old, but it is likely that Eukaryotes evolved earlier. Eukaryotes have large number of genes similar both with Archea and Bacteria. Thus, the eukaryotic genome may have been formed as a fusion of an archeum and a bacterium. Mithochondrion, a power plant of the eukaryote cell, is derived from an oxygen using symbiotic bacterium that was taken inside of an archeum related host cell. All present-day eukaryotes seem to descent from ancestor with mitochondria. It is still unclear whether the other eukaryotic features, such as the nucleus, developed before or after the mitochondrial acquisition. Gradually most of its genes were transferred into the nuclear genome. The energy production inside of mitochondria happens via oxidative respiration, and apparently, the oxic atmosphere has favoured the evolution of eukaryotic species. Later, in a similar endosymbiotic process, photosynthetic cyanobacteria was taken inside of a eukaryotic cells. This cyanobacterium developed into another organelle, the chloroplast. These cells, with the new chloroplast inside them, developed first into single celled eukaryotic algae, and later, into multicellular algae and plants.